It is taking me quite awhile to acclimate to cooking in England. The kitchen here is not well-stocked on cookware, and many of the pieces of equipment I use most often in the US are not easy to find at an affordable price. When I have found a deal, it has more than once come at the cost of horrendous quality. A cast iron skillet was high on my priority list, but the first one I order (for a bit more than a standard Lodge cast iron in the US) cracked while I was seasoning it. However, failure on this front was not an option. While it is a terrific cooking surface for many kinds of food, my interest in the cast iron skillet remains where the seed first took root: in making pizza. Having failed to locate quarry tiles within cycling distance of my new home, the skillet was my next choice for its high utility and (supposed) low cost. Fortunately my second skillet held up during seasoning, and I my effort was reward by an attractive black sheen on the pan and a successfully baked loaf of bread. There are some burn spots from places where pizza sauce has dripped, but the pan remains non-stick. 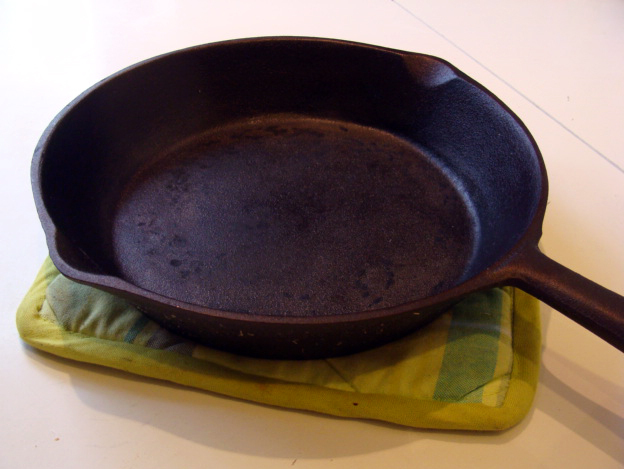 To season the pan, I first washed it with steel wool and hot soapy water. I then dried it on the stovetop, and while it was still hot I dripped a little light olive oil into the skillet and used a paper towel to wipe it all along the bottom and sides. I wiped away any excess oil with another paper towel, and then slid it into the oven preheated to 450 F with the pan upside down so any more excess oil would drip out (I used foil on a lower rack to catch any drips). After 30 minutes I removed it from the oven, wiped it down with a clean paper towel, and then applied more oil and repeated the wiping and baking. I repeated this for a total of four cycles, and then let the pan cool on top of the stove. This method is, as far as I can tell, the method recommend by Serious Eats’ Kenji, although there is some debate about what oil is best. Despite the debate, my method has left me with a skillet with a better non-stick treatment than many Teflon pans I’ve used. Within a few days I was using it to make a round of pizzas for my housemates, and after acclimating to the setup over the course of the first few pies I started reliably producing good results. But my inability to brew beer here has left me itching for further culinary challenges, so I set my sights on another type of pie: steak and ale pie. Not only is it traditional English fare, but it seems like a cast iron skillet would be just as suitable for this type of pie as any other. Steak and ale, soon to be baking in a pie. I picked up a pound and a half of chopped beef at a local butcher before heading to the grocery to buy mushrooms, onion, carrots, fresh thyme, beef stock, and the requisite ale. 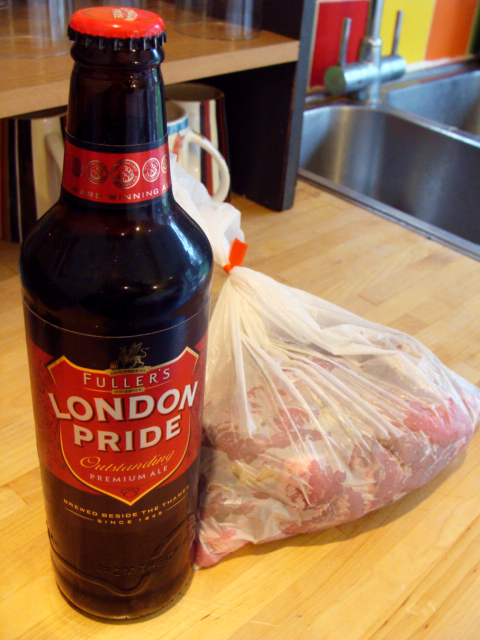 Having long been curious to try a beer from Fuller’s Brewery after sampled so many homebrews fermented with their ESB yeast (WY1968 or WLP002), I settled on a half liter of Fuller’s London Pride. About half went into the pie and I sipped on the rest while cooking. Essentially the innards of the pie are a stew of veggies and beef simmered in a gravy of stock, ale, and drippings thickened with flour. 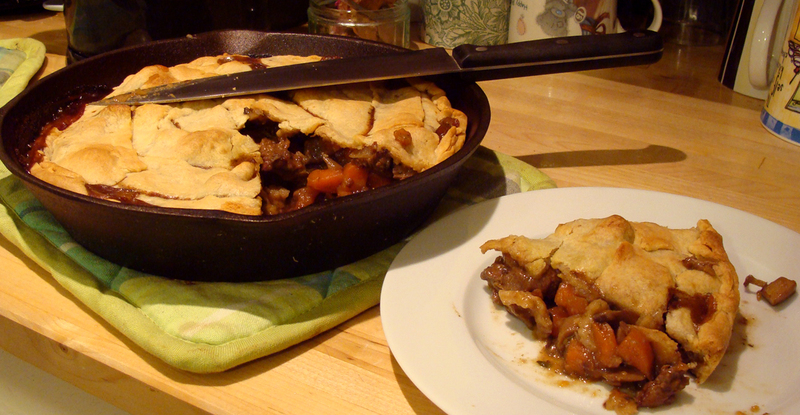 After the beef is fall-apart tender, the stew is chilled and used to fill a shortcrust pastry pie. I cheated and bought a pastry sheet at the store, since I don’t have a rolling pin (or the confidence required) for making pastry. The skillet performed admirably in the role of pie plate. Despite including an excess of gravy in the filling, the bottom layer of crust still cooked through, and the slices of pie slipped easily out of the pan. While from start to finish the dish takes quite a long time, most of the time spent isn’t active (stewing, baking, etc. ), and preparing the pie can be broken up into stages over the course of days: cooking the filling, making the pastry, and finally baking the assembled pie. It was so easy to make that I’m surprised that I’ve ever had a bad beef stew in my life – perhaps I was just working with higher quality meat than some restaurants I’ve had the misfortunate of patronizing. I’ve had a long-standing love for savory pies, but I rarely treat myself to them because they make for a pretty expensive meal. While this wasn’t exactly cheap to make, I could easily imagine myself springing for more savory pies in the future. The tender beef is accentuated by sweet onion and carrot as well as the warm toasty flavor of the rich, flaky crust. It’s like having a bite of biscuit with every spoonful of your stew. However, in the future I think I’ll save the ale. I think it would make a bigger flavor contribution accompanying the pie than being a part of it. This entry was posted in beer, equipment, learning, pizza and tagged cast iron, dough, England, pie, pub food, skillet, steak and ale on March 2, 2014 by Dylan Bargteil. I really want a t-shirt made for you that says, “I’ve had a long-standing love for savory pies”. Perhaps a cartoon picture of your Steak and Ale pie could be featured as well. I want to pick you brain about seasoning some of my cast-iron. I have a lot and never use it b/c I don’t feel like I am not using it correctly.